HUMANS HAVE BEEN BUILDING HOMES FOR THOUSANDS OF YEARS. On the journey from the first primitive huts to our modern-day constructions, there have been constant developments and improvements to the building methods used and also building materials themselves. We’ve come a long way since the days of using sticks and mud, though we can still make do with these resources when necessary. 330 million: The number of households worldwide suffering from a lack of secure, adequate and affordable housing. This equates to 900 million people. In recent times it might have seemed like the building industry had reached a glass ceiling of development, with only small incremental improvements being made rather than revolutionary new concepts being introduced. But as is the case with so many other industries, disruption and upheaval for the building sector are on the horizon. A new wave of technological innovation is shaking things up, and it’s coming at just the right time. We’re in the middle of a global housing crisis. Around 330 million households suffer from a lack of secure, adequate and affordable housing. By 2025 this figure will rise to 450 million households and effect 1.6 billion people. If you think this is a problem that is only hitting people who live in developing countries, the fact is that most major cities are experiencing a housing crisis. For example, the continued popularity of London means that the city needs to build 66,000 new homes a year to meet demand, and in addition to this, 65% of the homes need to be affordable housing. To make this happen London would need to double the rate of building, which is no mean feat. To meet this increasing global demand for housing the process of building needs to be sped up and to make housing more affordable costs need to be brought down. Traditionally speaking, you can’t solve both of these problems simultaneously. Building things more quickly tends to mean spending more money, and even then there are limits you can’t exceed. Reducing costs is equally challenging. Thankfully there is light at the end of the tunnel. Modular housing offers a way to both save time in the building process and to reduce costs, and it can do this without sacrificing quality. Modular building is basically the process of creating a house or building through the use of modules. These modules are usually prefabricated offsite in a factory setting before being transported to the building site and assembled there. This method saves huge amounts of time in the construction process, often reducing it from months to a matter of weeks. Saving this time automatically yields savings on labour costs. A key factor of modular housing is that as the modules are built offsite in factories, they can undergo rigorous quality checks before they leave for assembly. In fact, the quality increase of a modular build in comparison to a conventional build is estimated to be 50%. One thing to note is that there will be a change in the value chain for building houses. Those companies involved in the construction end of things will be losing out on value as the houses are constructed more quickly and with less involvement of the builders. This loss in margin might be offset by an increased number of houses being built, a larger volume. 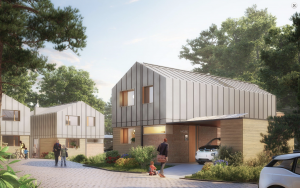 However, it might mean that traditional building companies will be initially resistant to fully embrace the move to modular housing, but over time they may be left with little choice. Homes built in this way are being seen as one of the potential solutions to London’s housing problems, and it’s easy to see why. There are numerous reasons to opt for a module build both for people building their own homes and for governments providing social housing. When modular makes more sense than traditional construction in terms of cost and time while delivering equal quality, it’s clear how this could become a runaway trend. In Germany prefabricated houses are already quite widespread, with around 100,000 new prefab homes being constructed annually. Building homes in a more standardised and modular fashion will also help greatly with the population transitions underway in developing countries, where increasing numbers of people are relocating from rural communities to cities. If the move towards modular homes continues in this upward trend for the foreseeable future, and if the method keeps improving, then in a decade the building sector may be a very different place indeed. Woodyshousing provides high quality and sustainable modular housing for temporary or permanent locations. Icon premiered a 3D printed 650 sq ft home at SXSW in March 2018 as a solution to combat housing deficiency. It is the first permitted, 3D printed home in America.